When it comes to camera bodies, I am very brand-non specific, having started with Minolta, moved to Nikon, and then to Canon. My firm belief is that they all make great products. I’m sure I would be just as happy shooting Olympus as anything else. I’ll save the boring story about how I ended up with Canon gear in my hand because it’s totally irrelevant today. I do suggest however that whatever you decide as your basis, sticking with the brand name lenses gives you the absolute best performance possible. Having said that, I’m very loyal to third-party brands that produce great accessories. I don’t want to get out with my gear and have something fail when I need it the most so I’ll share with you what I have found that has worked for me. 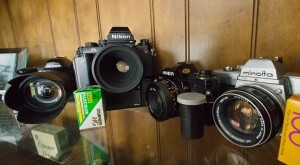 Some of the cameras I’ve retired. Click for large image. My current gear bag is made by Lowepro and it’s probably 15 years old. That in itself should be a good testament to the brand. I’m rough on it as I carry it around almost every day of the year. I’m in and out of it constantly and have never had one problem with it whatsoever. If I ever need another one I’m likely going for another Lowepro. So, what’s in that bag? 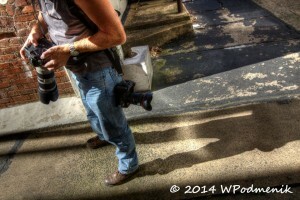 I carry a Canon 6D body, a Canon 7D MkII body, both with Canon battery grips and Kirk L-brackets. I also carry a 1DX with am L-bracket. The 1DX is Canon’s flagship model, just recently replaced by the 1DX MkII. The 6D is one of the best performing bodies ever in the high ISO ranges. Its relatively slow frame rate and loss of autofocus with lenses that have a maximum aperture beyond 5.6 limit its use for some shooting but its lack of some features put it in a price range that allowed me to justify shooting two until I got the great deal on the 1Dx. My primary use for these bodies is live music, where the subject is always in motion, the lighting is always very low, and extremely wide angles of view are a must. I also use them for wildlife when the sun is low. 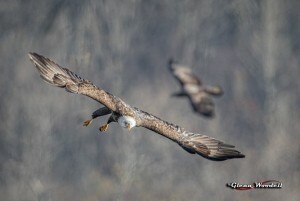 Extreme telephoto shot of eagle taken with 7D MkII, 500mm lens, and 2X teleconverter. Click for large image. I purchased my 7D MkII after the two 6D bodies because I wanted some of the features I was missing in the full frame versions. With a big interest in wildlife and supertelephoto lenses, the 1.6 crop factor and decent signal-to-noise ratio of the new 7D MkII caught my attention. It has a pretty high frame rate and it still autofocuses when I put a 2X teleconverter on an f4 lens. And with the 1.6 crop factor, it gives my 500mm lens the reach of an 800mm at the same aperture. Also in this bag, I usually carry a Canon 70-200mm f2.8 Series II. I call this a bread and butter lens because it has such a wide variety of uses. It’s heavy but you don’t get something for nothing. It’s very sharp for a zoom and the fast f2.8 aperture allows me to shoot some pretty amazing scenes. The tripod collar is convenient and the lens hood is sturdy. Looking for birds with my 70-200mm lens. Click for large image. I usually only carry one other lens in this bag. That’s my Canon 16-35mm f2.8. I’ve always loved the perspective that a superwide lens gives me and the fast, f2.8 aperture of this lens makes it perfect for live music and other low light shooting. Also in this bag is my Canon 2X Extender Series III. The Series III is noticeably sharper than the Series II, and my 2X is sharper than my 1.4X if you can believe that. So it stays in my bag and is almost always coupled to my big lenses. I also carry a Hoya variable neutral density filter, extra batteries, a 12mm extension tube for closer focusing in a pinch, extra tripod plates, the usual lens cleaning supplies, and ear plugs for the loud music shoots. The battery grips are a must for me. They make handling the bodies so much more comfortable, they retain the natural controls for vertical shooting, and they hold twice the battery power. The Kirk L-brackets really make the camera-battery grip combination solid, they provide for a robust mounting platform for my shoulder straps, and they have integrated, vertical and horizontal Arca-Swiss style plates for tripod mounting. In my smaller, auxiliary bag, I carry the items that I use much less often. I have a Canon 24-70mm f2.8 Series II that surprisingly, I don’t use much at all. While it may be the standard for many, I just find that the 70-200 and the 16-35, combined with both full frame and crop sensor bodies, covers almost all of what I need. Image from my 15mm fisheye lens. Click for large image. The three other lenses I keep handy are the Canon 50mm f1.8, the Canon 85mm f1.8, the Canon 15mm f2.8 fisheye, and the Canon 1.4X Extender Series III. Although I rely heavily on Canon products and their wonderful support via Canon Professional Services, my extension tubes are inexpensive Kenkos. I keep the 20mm and 36mm tubes in this bag as well. Outside of my bags I have the items that are too large to fit. 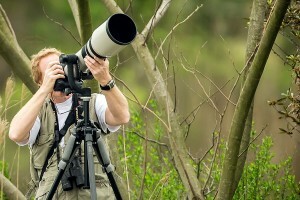 My pride and joy is my Canon 500mm f4 lens. That was my retirement gift to myself. It is so amazingly sharp, and with the Series III Extender added to it, it is still amazing. I rarely shoot without the teleconverter attached which is why it stays in my primary bag. When using this lens I usually use a reflex sight mounted to the camera’s flash mount, to aid in target acquisition due to the narrow angle of view this lens offers. Using my 500mm f4 lens on a gimbal mount. Click for large image. Next in line is my Canon 300mm f2.8 Series II. Like all of Canon’s (and probably the others’ as well) prime lenses, this thing is just phenomenal. It’s small enough and light enough to carry around for a while and can be handheld with not too much trouble. For the longer hikes, I have a Canon 300mm f4. Much smaller and lighter than its f2.8 big brother, it’s very compact and comes with an integrated lens hood. It also focuses closer than many lenses of its size. 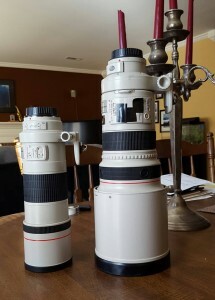 Both 300mm lenses, the f4 version on the left is much smaller and lighter (and much less expensive) than the f2.8 version. Click for large image. I recently upgraded to a very nice carbon tripod. I was amazed at just how much stability it gave me over my previous, aluminum one. I now use a Really Right Stuff tripod with one of their leveling bases and a quick release mount. I also got one of their very nice ballheads for scenic shots. Occasionally I pull out my Manfrotto monopod. It’s handy for the 300mm days when I may be in a crowd and where a tripod is just too much. For the supertelephoto lenses, I use a Custom Brackets gimbal on my tripod. If you’ve never used a gimbal with a long lens then you are in for a real treat. The cheap knockoffs can be had for under $100 and are fine for the lighter lenses. The gimbals, seen in the photo of me above, balance the lens about its center of gravity, making it easy and comfortable to move around with just a finger and it stays where you put it. 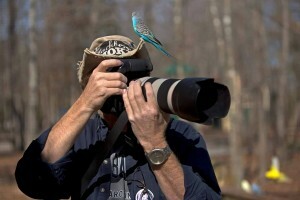 This is great for wildlife shooting where you’re doing a lot of panning. And finally, I am hooked on Black Rapid straps. I have the Sport, which I use when I’m just carrying one body, and the Double for most of my live music shoots and street touring, where I’m carrying two bodies. My Black Rapid Double strap in use, carrying two 6D bodies and 70-200mm and 16-35mm lenses.